Today, when so many transactions are done online, there are those who miss the kind of everyday, doorstep greeting of the milkman. So, when your lottery fee is collected at your front door, it’s about more than money changing hands. It’s a familiar smile, a shared joke and the type of friendly banter that lifts the spirits. So it was with great sadness that his friends at St Luke’s, and those who play our weekly lottery and pay their fee in person rather than online, learned that Lottery Collector Robert Gore – known as Bob – passed away recently. 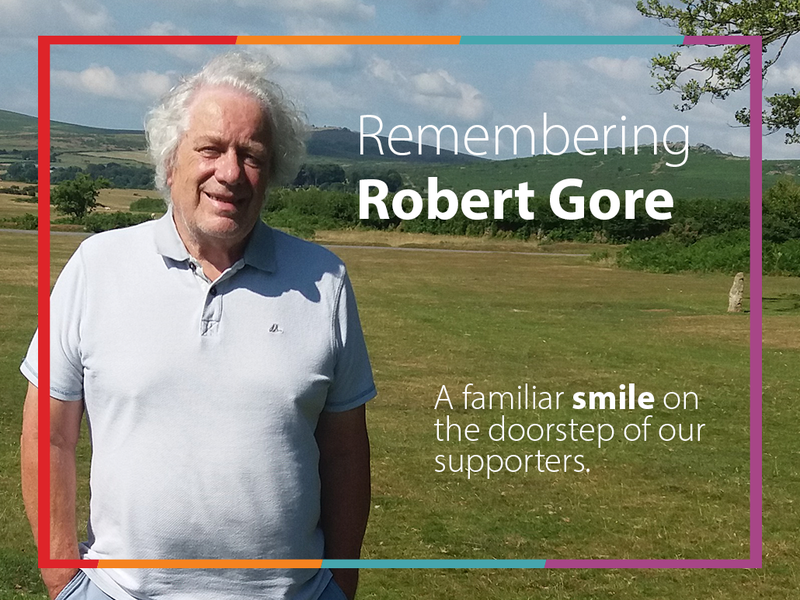 For the subscribers who met Bob every four weeks as he did his door-to-door collection rounds across Plymouth, Ivybridge and Modbury, he was a familiar, friendly face who always took the time to ask after them, swap a story and check if they needed any practical help, such as a letter posting. And, over the 19 years he worked his patch, he became fondly known as ‘Bob in the shorts’ due to his habit of sporting them, every day from April until the end of October. A proud ex-Royal Marine driver whose career also included railway work and improving opportunities for adults with learning disabilities, Bob was recruited to St Luke’s in 2000, after his daughter Sarah, who works for our charity, highlighted the vacancy for a Lottery Collector. Sarah said: “At first, dad took on the role mainly because he knew I thought so highly of St Luke’s, but he soon realised just how much the charity means to so many others, too. And when Bob became terminally ill himself, it was St Luke’s who cared for him, as well as supporting his family, including wife Margaret, Sarah and her brother Alistair, and grandchildren Daniel, Chloe and Phoebe. Sarah said: “Seeing the team looking after dad I witnessed firsthand their compassion and ability to quickly build up a great rapport. Thanks to them, he was able to pass away peacefully with us at home – even chatting away until shortly before he died and enjoying precious time with little Phoebe. Bob’s unwavering support for St Luke’s even extended to his funeral, which was family flowers only with donations invited for our charity. Learn more about St Luke’s Lottery.